Purging old files off your computer is like cleaning out your closet. Sometimes you find a “golden oldie” that you forgot about—and it brings a big smile to your face. The other day, I was deleting files on my computer to save space, and I rediscovered this gem. 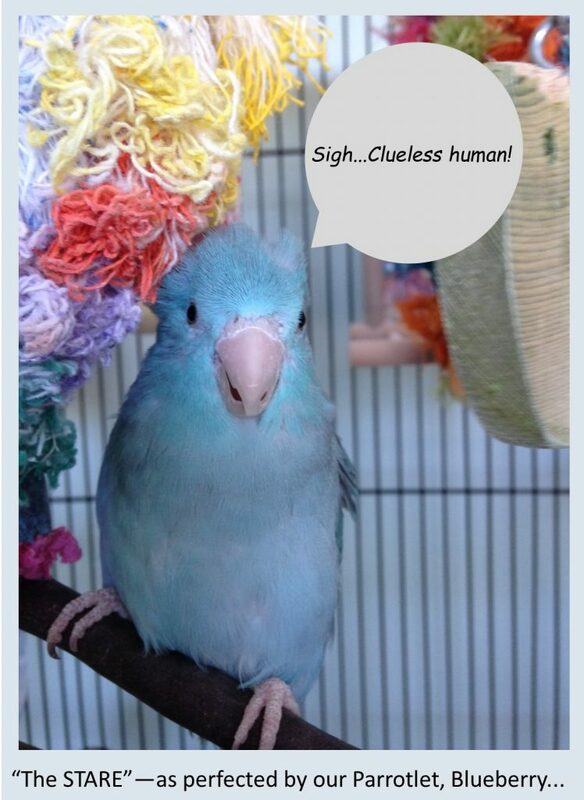 It’s a satire on us humans as seen through the eyes of our parrots—forwarded to me years ago by a fellow parrot lover—and it was so funny (and so true) that I just had to keep it. The author’s name was not given, so I am unable to give credit to whoever wrote it—but it was clearly written by someone who has lots of experience with parrots and understands them well. If by chance you know who wrote it, please let me know so I can give credit where credit is due—and also thank the author for making us laugh. Congratulations on the adoption of your new human! Humans can provide you with hours of fun and entertainment, and an almost unlimited source of tasty things to eat. However, your new human needs love, attention and, above all, training. Remember, a well-trained human is a happy human, and a happy human is much easier for a bird to live with. And manipulate. GreenPapers or Plasticy-Card-Things. These items provide much needed amusement for humans. They will spend hours playing with them, worrying about them, and caressing them. Most important, though, are the many tricks you can train your human to perform with them. A well-trained human can learn to trade all of her GreenPapers for an entire sack of treats, given proper training. Moving Den. A moving den is vital to the well being of all humans, as it gives them a place to yell at other humans from behind the safety of their glass windshields. 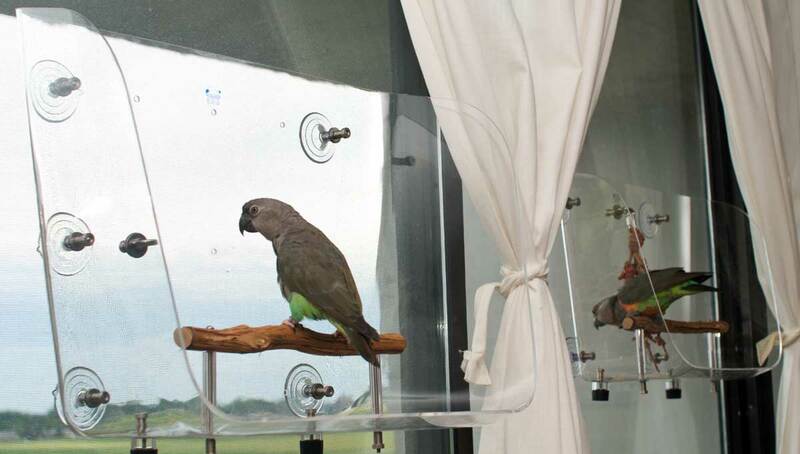 Unlike us parrots, humans can be shy about yelling at each other from behind the fence or front door, so the moving den (or car/truck/van, as humans like to call them) provides a valuable place for your new human to let off steam. Your human can also be taught to transport you to parks, cafes and pet treat emporiums with just a little bit of work on your part. Plastic Yelling Toy. A plastic yelling toy, or ‘phone’, as humans like to call it, is essential to your new human. They will spend hours using it to extoll your beauty to all of the other members of their pack. Remember, though, that humans can become so absorbed in their talking toy that they might neglect you, or ignore their training lessons. Learn to pull the cord from the wall with your beak if this happens. Plastic Yelling Box (aka ‘Computer’). See Plastic Yelling Toy for details. Now, let’s move on to basic training. The first thing you need to do is teach your human to respond to basic commands. Mastering “The Stare” is the foundation of all good human training. Practice it, and the world is your oyster. Few humans have proven to be immune to this technique, but if you happen to find yourself saddled with one who is, feel free to trade them in for a more tractable example of the breed. Basic technique for the S T A R E is as follows: Corner human some place where they have limited opportunity for movement. For example, try using the S T A R E when your human is distracted by their plastic yelling box, or the large-hot-thing-which-makes-food. Gaze unblinkingly into your human’s eyes. Do NOT break eye contact — this is vital. When you are certain the human has your full attention, signal your intent to them with a long, soft, quietly drawn out peep. The peep combined with the S T A R E should by now have your human fully mesmerized. Since humans are, believe it or not, actually quite eager to learn, yours should by now be trying out various options to see just what action it is you want them to perform. In short order, they will usually begin to list off “Wanna come out?” “Are you hungry?” and other inquisitive statements. When they finally arrive at the trick you require them to perform, signal your approval with a series of wiggles, spins and dashes in the direction to which you would like your human to go. Be patient! Unlike us, humans can take a while to learn to respond immediately with what you had in mind. The human ‘mind’ is not as evolved as ours, so frequent and prolonged repetition of the training session will be required. I have managed to train some in as little as one hour, whereas it once took an entire month to train a male human to cook me food at 4 am. Customers are often curious about how our company, Wingdow®, came into being. It’s an interesting story—probably not too unlike the stories you’d hear from other small business owners—but interesting nonetheless. Like many small companies, Wingdow® started with an idea—a very good idea—that took root as a result of a changing life circumstances and came to fruition after years of hard work and a lot of blood, sweat, and tears. My husband, John, and I were corporate consultants who just happened to have birds. We never had any intention at all of becoming a manufacturer of pet bird products. In fact, it was the furthest thing from our minds. We just noticed the kind of activities our birds liked and built things around those activities that we thought would make our birds happy. One thing we noticed about our birds—and many of our friends’ birds—is how much they like windows. And–how much happier and active they seemed to be when they were at the window catching rays and enjoying the activity outside. It seemed to us that they were just trying to recapture some of what they do in nature—which is spend a large part of their day atop trees, soaking up the sunlight and just looking around. Our Senegal, Pook, in particular, really, really loved his sunshine and sitting at the window. He also liked to CHEW our windows. We didn’t want to deprive him his beloved windows—so John went over to Home Depot early one Saturday morning, dropped $150 for some generic sheet plastic and stainless hardware, and (five hours later) installed the first crudely built Wingdow® Seat on one of our office windows. To say it was an instant hit is an understatement. Pook is by no means an early adopter, but he flew right to his new Wingdow® Seat and let out a loud “chireeeep!” in delight. Then—our Pionus, Sapphie, became interested enough in the Wingdow® Seat to chase Pook away. So—the next day, John went back to Home Depot, shelled out another $150 for materials to build a second one for another office window. This was followed a week later by Wingdow® Seats three and four for the birds’ room. Those first few Wingdow® Seats were made of acrylic sheets joined by ugly metal corner brackets with pop rivets that soon cracked the plastic. They were not particularly pretty—but the birds just loved them–and they spent a good part of their day on them. Fellow bird lovers who came to our house saw the Wingdows® and how much our birds loved them—and urged us to make them for others. We toyed on and off with the idea of manufacturing Wingdow® Seat for several years—five years to be exact–but never gave it serious thought until we brought our new canary, Lucero, home. The first time we let Lucero out of his cage, he flew directly to the Wingdow® Seat nearest his house. His next stop was the Wingdow® Seat on the other side of the room, hidden by a large plant display. He must have been planning his flight from his house by watching our parrots, Pook and Sapphie. From that point on, we knew it was some kind of cosmic duty to share this happiness with other birds. Still—Wingdow® might not have happened had it not been for a very difficult and sad time in our lives. My mother’s breast cancer had spread, and her illness was considered terminal. I left town for months on end to be with her and to take care of her. With me gone, John found himself with time on his hands, and he started looking into what it would take to manufacture Wingdow® Seat. He worked tirelessly for months—talking with bird experts, designing the shape, researching and sourcing the raw materials and hardware, building prototypes, and thoroughly testing each one. The result is the Wingdow® Seat product you see today—durable, elegant, unique and built to last. That was over 12 years ago, and I’m pleased to say that we have many happy Wingdow® customers—both bird and human. Wingdow® has never been about making money for us. It has truly been a labor of love. We love that our product has enriched the lives of our birds—and now the lives of many other avian friends. Our lives have been enriched as well. We have met many, many wonderful people since starting this business—people who share our love and passion for birds and our commitment to making life better for these wondrous creatures. Since introducing Wingdow® Seat, we’ve added several all-stainless steel playstands to our product line. Once again, we had no intention of manufacturing gyms—but we started doing so at the urging of customers who liked our Wingdow® Seat–and who felt we could bring something unique and creative to the world of bird gyms. Like Wingdow® Seat, our Wingdow® Gym and line of stainless modular playstands are made of the best materials available and are built to last. We use high quality, American-made stainless steel in the construction of all of our playstands—which we know is both durable and 100% bird-safe. Will we continue to build new products? Probably. As long as we believe can bring something unique to the world of companion birds and contribute to their quality of life. Over the past year, we have been working on building our new website and blog–and now that it is finally done, we think it’s only fitting to dedicate it to the bird that started it all—our Senegal parrot, Pook. Our beloved Pook left us on August 2nd, 2013—and we are still very much mourning his loss. But, we are also eternally grateful for the joy and love he gave us—and for the things he taught us each and every day. So, you see, Pook was more than just a bird-friend to us. He was our product designer, tester, and business partner—and with one day of inspired beak-artwork on our windows, he put our careers and lives on a whole new path. Pets are like kids. We all think we have the most extraordinary one alive. Prejudice aside, Pook was one EXTRAORDINARY parrot. He was extremely verbal, mastering over 100 words and phrases—mostly out of frustration and impatience because we were too dumb to learn his language. We were greeted every morning with choruses of “I love you”, “there’s my John”, “hi, sweetheart” (although his was more a Bogey-esk “hi, schweetheart”), “got treat?”, “want shower”, “want apple”, “tank-ku” (parrot for “thank you”)—and more. At night, he would announce bedtime with a “go to bed” command or a “wanna go to bed?” question. Occasionally, he would string phrases together—like when he greeted a female friend of ours with “Hi, schweetheart. Wanna go to bed?” Of course, it can be argued that he didn’t know what he was saying—but you’ll never convince us of that. He was one smart bird—not to mention a major stud-muffin. He was also a super athlete. Like many Poicephalus parrots, he loved to swing. He would spend hours in his house every day just swinging and chireeeping for joy. He would pump that swing—making it go higher and higher—and then do a pole dance around the arm of the swing while it was still in motion. It was awesome to watch! He loved swinging so much that we designed what is probably the most over-engineered and expensive bird swing ever made—just to satisfy Pook’s need-for-speed. We also always knew exactly where Pook stood on things. If he liked something, there would be a joyful “squeak-o!” and tongue wagging. If he didn’t like something, he would give it the “evil eye” and/or immediately voice his disapproval with a ear-splitting “aaaaak!”. That’s also what made Pook such a good test-bird for Wingdow® Seat and our other products. We always got an immediate “let it live”–or “hell no”. Most important, he taught us—and especially me–to love birds. Husband John had birds in his life off and on—but I grew up with a Dutch mother in a super clean Dutch household where pets and their messes were not allowed. And, although I had the world’s greatest and well-meaning mother, I missed a lot by not being allowed a pet. Pook was a gift from my husband, who felt sorry about my pet-deprived early life. Pook was my first bird—and my first pet—and like many first time bird owners, I was totally blown away by his intelligence, sensitivity, and sense of humor. I also felt deeply privileged by his acceptance of me as friend and flock member—and by the love both John and I received from him every day. Pook was my first bird-love—and you never forget your first love. After Pook passed, we contacted the International Star Registry and had a star named after him. It was our way of dealing with the pain of our loss–and immortalizing an extraordinary bird and friend. Fittingly, the star is named “Pook”. For those of you into stargazing, the Pook star can be found close to the handle of the Big Dipper (Ursa Major) constellation at coordinates RA13h31m11.44s D57°50’8.86”—and it can be seen with the naked eye. 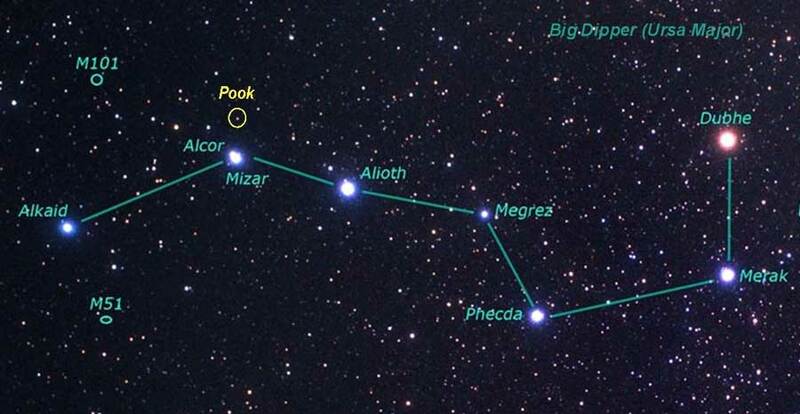 So, if you’re ever outside on a clear, starry night, look up at the Big Dipper and say “hi” to our Pook. He’s undoubtedly looking down on you. And so, it is with love and gratitude that we dedicate or new Wingdow® website to Pook—our teacher, friend, and Wingdow® founder–and bird-extraordinaire. There will never be another bird like you. 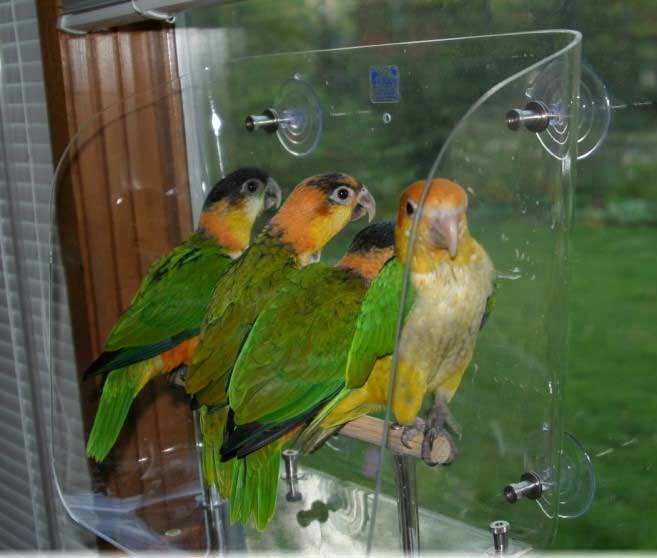 We make products for companion birds. Lots of companies do that—so what makes Wingdow® different? It’s probably easiest to start with what we’re not.